The Corps of Cadets at New Mexico Military Institute operates within the framework of a military organization with a cadet chain of command, headed by a Cadet Regimental Commander, under the supervision of the Commandant of Cadets and his staff. Working closely with the regimental commander and other cadet commanders, the staff is composed of officers and non-commissioned officers of the U.S. Army in the Military Science Division and other highly trained professional leaders, either retired military or with military experience. Upon enrollment, new cadets become part of the Corps under the traditional “new cadet-old cadet” system. New cadets are generally assigned to rooms in the barracks with fellow new cadets of the same academic year. Periodically, they may have a roommate that is one class behind or ahead of them. As a new cadet, the cadet is trained and held to the highest standards. New Mexico Military Institute is a globally recognized secondary and post-secondary learning institution for young men and women that instills excellence in leadership, academics, and physical development within a structured environment empowering students to thrive in a dynamic world. To educate, train, and prepare young men and women to be leaders capable of critical thinking and sound analysis, leaders who possess uncompromising character and leaders able to meet challenging physical demands. Treat them as you would like your own treated. Teach them as you would like your own taught. Roswell, New Mexico dates back to 1866 when it, then known as Rio Hondo, was a cowboy outfitting station on a cattle trail. It acquired a post office in 1873 as well as the name Roswell. This area of Southeastern New Mexico around Roswell, the historic border between the Comanche and Mescalero Apache tribes, was then only sparsely settled. In 1891, Captain Joseph C. and Mabel Lea invited Robert S. Goss to start a military school similar to the school Goss directed in Fort Worth, Texas. In September, Goss Military Institute opened its doors to twenty-eight pupils. Struggling as a result of poor management and insufficient funds, Goss Military Institute did secure designation as a territorial school and a new name, New Mexico Military Institute, but had to close its doors in 1895. An appropriations bill passed by the territorial legislature and a generous donation by a resident philanthropist, J.J. Hagerman, of a forty-acre plot of land on North Hill helped reopen the doors of New Mexico Military Institute in its present location on September 6, l898. The school provided eight years of academic work and the cadets were organized into two companies. After the Institute inaugurated the junior college in 1915, the school offered four years of high school (NCA accredited, 1917) and two years of college work (NCA accredited, 1938). The Corps of Cadets operates under an Honor Code, instituted in 1921 by a vote of the Corps of Cadets. This Code is recognized as the primary means by which character development is accomplished at the New Mexico Military Institute. The Code requires all members of the Corps of Cadets act honorably in both word and deed. A cadet shall tell the truth at all times, not quibble or make evasive statements, do their own work and not cheat, plagiarize nor take unfair advantage. Each cadet is also responsible for maintaining these standards. A cadet will not only do what is right, but will have a desire to live by such a standard. 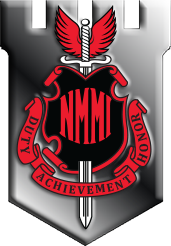 New Mexico Military Institute gained special recognition as a military school receiving the distinction as one of ten such distinguished institutions in 1909. In addition to retaining this distinction ever since, the school became a member of the Reserve Officer Training Corps program in 1916. NMMI sent 320 alumni and 163 officers into its country’s service during World War I. The school’s service to World War II was virtually unparalleled with over 170 young men losing their lives. After experimentation with a four-year college in the nineteen fifties, NMMI returned to its high school and junior college program. With the support of a strong Early Commission (ROTC) Program in the junior college and special NCA recognition (1980) as a college-preparatory high school, the school has persistently increased its emphasis in recent years on its academic programs. Annually, approximately seventy cadets prepare for admission to the national service academies and join nine hundred thirty other young men and women in meeting the challenges of one of the nation’s most unique and finest preparatory schools.